For many, many years, I've had a blog at the (now unfavored) LiveJournal, where I mostly kept my writing. Original poems, interviews, and book reviews, lengthy series about Shakespeare, Jane Austen, and more. It is still in use, but I am considering winding it down, quite frankly. However, I have an ongoing poetry project with five (sometimes six) beloved poetry sisters, and we write new poems each month on agreed-upon topics or using agreed-on forms. Kismet sleeping on my legs. This month's assignment was to write a sonnet (on any topic we wanted). 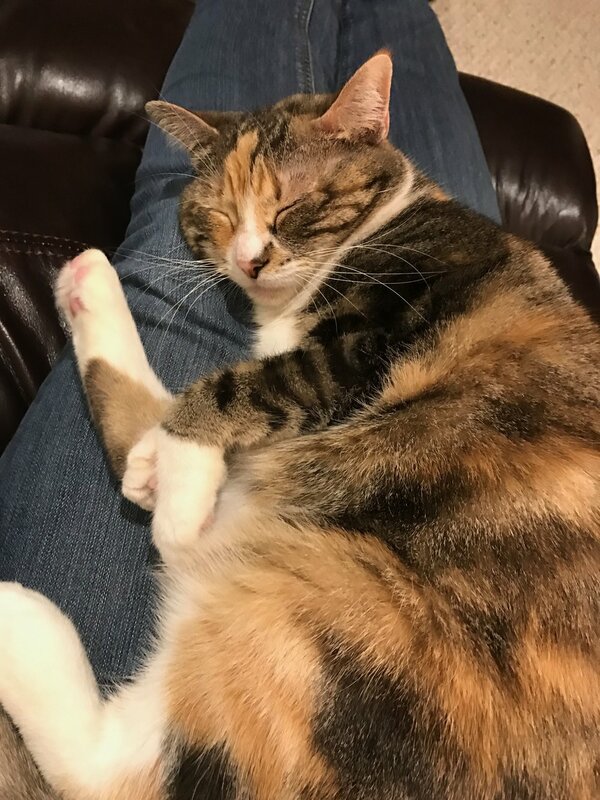 I chose to write about Kismet, my six-year old calico. peck gravel for small sustenance at best. to follow hops and jumps, small bursts of flight. us knowing that is all a flock of lies. with pink toe-beans on all four small white feet. curls up, then dreams of birds during her nap. I am unsure whether the rest of the poems will move here or not, but as this is ART & WORDS, I thought I'd see how it goes.